The world-famous Route 66 is colloquially known as the 'Main Street of America' or the 'Mother Road'. This is because it originally ran from Chicago, Illinois, through Missouri, Kansas, Oklahoma, Texas, New Mexico, Arizona, and California, before ending in Los Angeles. The stretch of highway has been immortalised by famous singers such as Nat King Cole and even the Rolling Stones. The starting point in Chicago has moved a few times over the years and in 1933, the start (and end) was moved to Jackson and Lake Shore Drive. The starting point remained here, so even while Adams Street at Michigan Avenue is marked as the starting point, Route 66 has never departed from there. 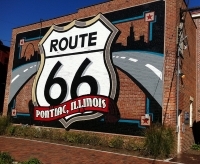 The recognised end of Route 66 is located at the intersection of Jackson Boulevard and Michigan Avenue (which is marked as the terminus). This landmark is a sort of pilgrimage site for those interested in the pop culture of America.